The Conservative Party have released a new poster, coinciding with the start of the dog show Crufts, attacking Labour’s plan to introduce a requirment for pet owners to take out 3rd party insurance. The proposal is estimated to affect around 5 million people. 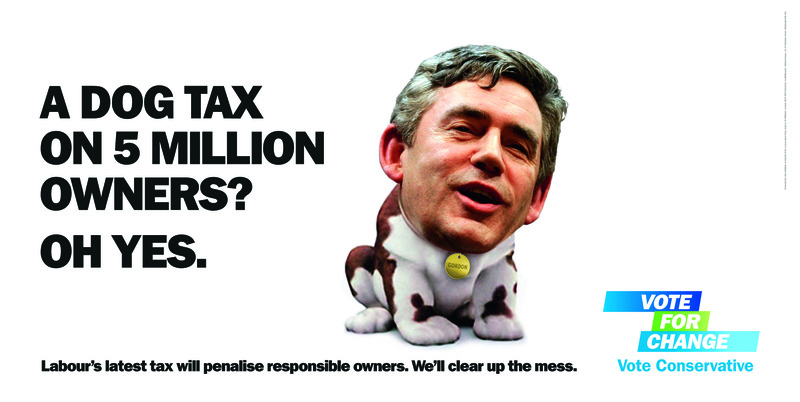 The poster depicts Gordon Brown as the dog from the slightly nauseating Churchill Insurance adverts and carries the canine’s catch phrase in the headline ‘Oh yes’. It’s a fairly light-hearted attack that will probably raise a smile for most people. It’s in a similar vein to the R.I.P attack advert from last month, making a slighty cheap gag about a relatively minor point of policy, but the tone and style of this execution is more appropriate. These sorts of probing attacks are the political equivalent of a cheeky slap in the face and not the sort of communication that wins elections. However, it’s early days in the long campaign and this sort of activity is an easy way of getting a few headlines and keeping the Labour ‘stealth tax’ agenda ticking over. Oh No! He told me he was having tea with Eddie the Eagle…..